Today I am pleased to post the first of a two-part interview with David Swartz, author of the newly released Moral Minority: The Evangelical Left in an Age of Conservatism (University of Pennsylvania Press). David is an assistant professor in the History Department at Asbury University in Kentucky, and he began this project while working with George Marsden at Notre Dame. I first encountered David's work just after each of us defended our dissertation on the evangelical left in 2008. You can imagine our surprise—and initial consternation!—to discover that another scholar was working on the same general topic with many of the same materials. But as we communicated and read each other's work, it became clear that our studies would be complementary rather than directly competing or conflicting. My own forthcoming book analyzes the public theology that inspired the political positions and persistent activism of progressive evangelical leaders from the 1960s through the present. David's book analyzes the genealogy of the evangelical left beginning in the mid-twentieth century; its trials in the 1970s and 1980s; and why, despite initial promise, it failed to take substantial shape electorally as the Religious Right rose in prominence. As the first scholarly treatment of the evangelical left, Moral Minority is already receiving lots of attention (see, for example, Molly Worthen's review in the New York Times). I'm pleased that David took time to answer these questions. Come back tomorrow for the second part of the interview. Brantley Gasaway (BG): Many people are interested in how authors come to study their subjects—tell us what led you to write about the evangelical left. David Swartz (DS): Like any enterprising graduate student slogging through comprehensive exam lists, I was on the lookout for a gap in the scholarship of American religious history—and archival materials to exploit that gap. 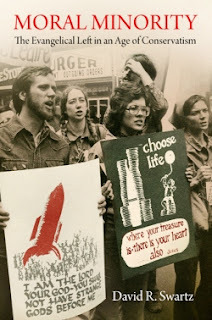 When I read a piece by progressive evangelical activist Ron Sider online suggesting that some “enterprising graduate student” take a look at the Evangelicals for Social Action archives, I knew immediately that I had a project. On a more personal level, this project was an attempt to figure out my own parents (history is ultimately autobiography, right?). They had grown up in the 1970s. They ran a pretty egalitarian marriage. They sang “They Will Know We Are Christians by our Love” during worship services and would have been dismayed by an American flag in the church sanctuary. I ate food my mother (and father!) cooked out of More-with-Less, a cookbook with lots of vegetarian recipes. And I knew many like them, church-goers who were not comfortable with the idea of American as a Christian nation, a budget that prioritized the military over poverty, a punitive criminal justice system, and the like. And yet they shared their faith and lived out the kind of warm piety so common among evangelicals. This was an idiosyncratic combination that I never read about in news reports and scholarly books. I was curious about how typical they were—and why they seemed so marginalized in the public eye. BG: Over the past several decades, the Religious Right has loomed large not only in popular perceptions but also in the historiography of evangelicalism. What factors beyond the greater visibility and apparent success of conservatives have led to the lack of research on the evangelical left? DS: You’re right that the historiography has been preoccupied by research on politically conservative strains of evangelicalism. It makes sense. Scholars have been working in the midst of a resurgent conservative movement. The administrations of Ronald Reagan and George W. Bush have had close ties to right-wing evangelical activists. But this weight of journalistic and scholarly attention has effectively created a caricature of evangelicalism as a monolithic political bloc. On the other end of the spectrum, historians have ably charted religious progressivism within mainline Protestant, Catholic, and Quaker circles. These discrete historiographies obscure connections between progressive politics and evangelicalism. All this, of course, is getting problematized. The rise of cultural history and lived religion is slowly bringing with it non-electoral emphases. And so more attention is being paid to the activities of evangelicals involved in local, regional and international acts of compassion; human and civil rights activism; campaigns for voluntary simplicity; intentional communities; attempts to carry out a consistent life ethic; and so on. These sensibilities increasingly find resonance among politically conservative and progressive evangelicals. BG: Both scholars and many evangelicals themselves debate the definition and boundaries of evangelicalism. You argue that "the reality of a politically diverse and fluid evangelicalism is, in fact, embedded in the tradition's very structure." How does understanding the history of evangelical left since the mid-twentieth century helps us understand the evangelical movement as a whole? DS: Many in the 1970s saw moderation as the future of evangelicalism. Among other things, shifting electoral realities ensured evangelical loyalty to the Republicans over the Democrats. But the persistence of moderate and progressive strains among significant swaths of evangelicals is yet another reminder of just how varied a movement evangelicalism is. The National Association of Evangelicals proper consists of 43 member denominations. Scholars consider at least a thousand more of the nearly 4,000 Protestant denominations in the United States to be theologically evangelical. Many evangelicals now identify primarily with social service agencies, missionary organizations, colleges, individual congregations, or even evangelical celebrities. These varied loyalties leave a lot of room for political and cultural diversity, and evangelical gatekeepers have difficulties enforcing their orthodoxies. They try: Harold Lindsell did with Battle for the Bible in the 1970s in defense of biblical inerrancy as an evangelical litmus test, and John Piper tweeted “Farewell Rob Bell” in response to Bell's ostensible promotion of universal salvation in his recent Love Wins. But there really aren’t any effective mechanisms for reinforcing porous borders around a group without any clear structure. This pattern was entrenched through the democratizing impulse of the Second Great Awakening in the early nineteenth century. The “priesthood of all believers” theology that emerged now undergirds the contemporary movement and encourages evangelicals to shun hierarchical systems of governance. And so throughout American history, there have been both evangelical conservatives and dissenters. In the eighteenth century, British abolitionists challenged the slave trade. In the nineteenth century, some American evangelicals dissented from the Whig establishment to establish communitarian utopias. At the turn of the twentieth century, North Carolinian populists for a time challenged Jim Crow. Others worked on social issues such as temperance, abolition, industrialization, suffrage, and civil rights unionism. This unpredictable and strikingly variable politics also persists globally. In contemporary Brazil, for example, evangelicós have participated substantially in all the major political parties. And global evangelicals are carrying more weight within the United States, especially as the nation has increasingly opened to non-white immigration since the Immigration Act of 1965. Many combine conservative theological and moral stances with progressive economic and foreign policy views in ways that defy the Western imagination. This should be no surprise for such a decentralized religious movement. BG: You analyze a wide variety of influences upon the left-leaning evangelicals who came together as a loose coalition to issue the 1973 Chicago Declaration of Evangelical Social Concern. How would you summarize the social, political, and theological factors that inspired the rise of the evangelical left in the late 1960s and early 1970s? DS: I’ll highlight just three. In the 1950s neo-evangelicals began making a theological case for increased social engagement. Carl Henry’s TheUneasy Conscience of Modern Fundamentalism contended that the world could be redeemed—at least a little. Others, such as Donald Dayton, called for evangelicals to return to nineteenth-century patterns of evangelical social action in support of abolition and women’s suffrage. Many repudiated the dispensationalist formulation that souls were all that mattered. Whether this social engagement took rightist or leftist shape was secondary to the more fundamental call for evangelicals to go public with their spiritual commitments. This theological trajectory coincided with rising levels of education among neo-evangelicals. Faculty at Wheaton and Fuller were amassing impressive credentials from and being exposed to progressive thought at Ivy League institutions. Evangelical college students were reading works such as The Other America, Soul on Ice, and the Kerner Report that questioned the conservative and apolitical assumptions of their parents. As a whole, evangelicals who would form the core of the evangelical left began to think less individualistically and more structurally about poverty, war, and the ways in which government might address social problems. And finally, the evangelical movement at midcentury was expanding its constituency with confessional religious conservatives emerging out of ethnic ghettoes. Dutch Calvinists, Swiss-German Mennonites, and lots of evangelical immigrants from around the world were joining the National Association of Evangelicals. Many of them—such as Samuel Escobar from Peru, the Reformed thinker Richard Mouw, and the Mennonite Ron Sider—shaped the evangelical left in significant ways. Great interview. Looking forward to the second part. I remember wondering about some of these topics and issues when I was working on a master's thesis on politically conservative white evangelicals and racial issues in the 1950s and 1960s. So glad to see this new historiography taking hold. Brantley, I agree that your work and David’s are complementary. They both have informed my thoughts on the interplay of evangelical right-evangelical left currents since 1970. Thanks for this, Brantley. I'm looking forward to adding your and David's books to my Christianity and Politics class reading lists.